Having been through difficult times over the years, I can empathize with others who are going through these same seasons. My poetry, artwork, and blogs are designed to encourage believers and non-believers to see the Truth contained in God’s Word for every situation; but especially to draw people, who are unaware of the blockages to the Holy Spirit’s voice, into a stillness and quietness of mind in which they can hear with their spiritual ears. It is amazing how God can communicate His thoughts to us when we are quietly contemplating nature and His Word. Another reason I use the Scriptures as a direct basis for some of my poetry, is so that readers can see that I am not just throwing out random thoughts, but there is a firm basis for why I believe and write as I do. 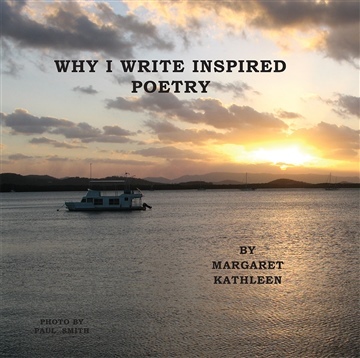 Margaret Kathleen is a great-grandmother who like to share her faith in the form of inspirational poetry and prose, accompanied by photos of nature and her oil paintings. She lives with her husband, David, in South Gippsland, Victoria, Australia, and they attend a small church in Leongatha. Margaret is passionate about encouraging others in their faith walk, and helping them to better understand the Scriptures.